(MENAFN - Kashmir Observer) TEHRAN — Iranian people have started the 10-Day Dawn celebrations to mark the 40th anniversary of the country's 1979 Islamic Revolution, which overthrew the monarchy of the US-backed Pahlavi regime in Iran. 'The outcome of the president's policy review should be to determine that the Ayatollah Khomeini's 1979 revolution will not last until its 40th birthday. And that's why, before 2019, we here will celebrate in Tehran!' he told a terrorist MKO convention in Paris. Iranians, however, are facing a dramatic rise in US pressures through tough sanctions imposed last May, which prompted Leader of the Islamic Republic Ayatollah Seyyed Ali Khamenei to warn of bigger subversive American plots for 2019. The nationwide ceremonies kicked off at 9:33 a.m. local time (0603 GMT), the time when the late founder of the Islamic Republic Imam Khomeini returned to the Iranian capital on February 1, 1979 after a 15-year exile in Paris. A special ceremony is being held at Imam Khomeini's mausoleum south of Tehran, with a host of senior state and military officials as well as thousands of people from all walks of life in attendance. Another ceremony is held at Behesht-e Zahra cemetery south of the capital, where Imam Khomeini delivered his first speech after the exile, in an address to five million people. Similar ceremonies are held across Iran and in other parts of the world to mark the first day of the Ten-Day Dawn period. On Wednesday, Ayatollah Khamenei paid respect to Imam Khomeini and Iranian martyrs in the lead-up to the Ten-Day Dawn period. Ayatollah Khamenei visited Imam Khomeini's mausoleum in southern Tehran, where he offered his prayers and recited verses from the Holy Qur'an. Ayatollah Khamenei pays respect to the late founder of the Islamic Republic and Iranian martyrs as the country prepares to mark the 40th anniversary of the 1979 Islamic Revolution. The Leader then visited the burial ground of martyrs, where he prayed for the souls of the people who lost their lives either during the popular uprising that led to the Revolution or in the course of their struggle to uphold revolutionary values afterwards. Ayatollah Khamenei also paid tribute to those martyred on June 28, 1981, during a bomb attack staged by the notorious US-backed Mujahedin Khalq Organization (MKO) terror group in Tehran. The Leader further offered prayers at the tombstones of those who lost their lives during the 1980-88 Iraq war against the Islamic Republic. 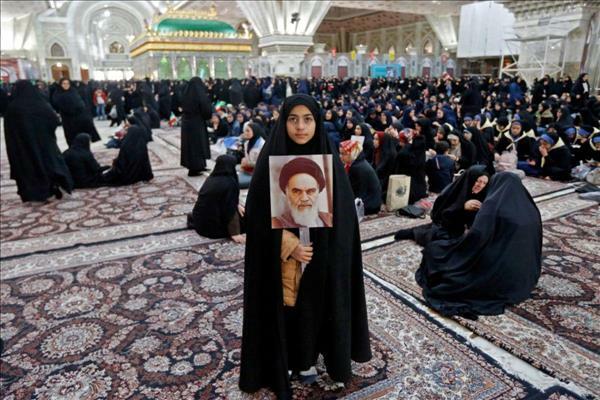 Imam Khomeini spent more than 14 years in exile, mostly in the Iraqi holy city of Najaf. He also spent some time in Turkey and France before his return to Iran. Millions of people converged on the capital from across the country on the day of his return. His arrival gave considerable momentum to popular protests against the US-backed Pahlavi regime, which eventually led to its overthrow ten days later. The 10-Day Dawn festivities will culminate in nationwide rallies on February 10 this year, the anniversary of the Islamic Revolution. The period witnessed last-ditch efforts by the Washington-backed regime of Iran's former monarch to hold onto power by unleashing deadly force against pro-Revolution protesters. The entire struggle resulting in the Revolution was led by Imam Khomeini, who successfully united the people against Pahlavi oppression and dependence on the US.